Your smile is even more unique than you realize! All of the underlying structures that support your smile, including bone, soft tissue, and nerves, are one-of-a-kind. Cone beam technology refers to a specific type of X-ray that is capable of creating a 3D image that includes all of these supportive structures in a single scan. 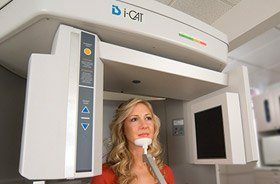 With this technology, a single, cone-shaped X-ray beam provides a large number of images, or “views,” of the structures that support your smile. Then, specialized computer software merges these images together to form a singular 3D view that our team can use to develop a detailed and accurate treatment plan for dental implants or root canal therapy. And, as an added bonus, cone beam technology utilizes less radiation than traditional X-ray technology!